This is the second of two stories exploring the history underlying the names of various streets in West Hollywood. The first was published July 5. The year when each street was dedicated is indicated after the name. Such information is on file at Los Angeles County’s Public Works Department, because all city thoroughfares were named when the Sherman / West Hollywood community was under county jurisdiction. The Sunset Strip isn’t an official street name, but it is West Hollywood’s most identifiable asset. Businesses along the curvy section of Sunset Boulevard that cater to the music, comedy, celebrity and glamour crowds generate worldwide publicity and a hefty portion of the city’s annual tax revenues. How many people realize that residents preferred another nickname for The Strip when a contest was held in 1937? They chose “The Sunset Eighties,” a reference to the 8000-numbered blocks that comprise the meandering stretch of Sunset Boulevard through West Hollywood. Sponsored by the Hollywood Citizen-News daily newspaper, the contest paid the winner $25 for his submission. “It tells people where we are – and it’s catchy,” an executive with the Chateau Marmont hotel told the newspaper. The contest, by the way, was held in 1937 to mark the first time the entire length of Sunset Boulevard was paved, notes Sunset Strip historian Jon Ponder. County crews doing the roadwork simply called the street “the county strip,” and the name “Sunset Strip” stuck instead of the winning contest entry. City officials ever since have zealously guarded the nickname, seeking to make sure it is closely identified with West Hollywood. A 2004 story in The New York Times about the landmark Argyle Hotel along the Strip carried a “Hollywood” dateline, sending the Convention and Visitors Bureau into a protectionist dither. The bureau launched a campaign over which clubs and eateries along Sunset Boulevard could rightfully claim they were on the Sunset Strip and had the right to use the nickname. Brad Burlingame, the late head of the bureau, said the name should not be applied to the stretch of Sunset Boulevard that extends east of their city into neighboring Hollywood. Burlingame claimed to be merely protecting the city’s most identifiable asset by taking steps to prevent Los Angeles from hijacking the Sunset Strip’s aura. “A city as big as Los Angeles is confusing to everyone, and West Hollywood’s borders are very difficult to understand,” Burlingame told the Los Angeles Times. The rest of Sunset Boulevard has a notable history too. The street existed as early as 1780 as the major connecting road for El Pueblo de Los Angeles and all ranches westward to the Pacific Ocean. It originally was called Bellevue Street, with small sections named Short, Bread and Marchessault streets (after L.A.’s seventh mayor, Dennis Marchessault). Sunset began on the hilltop estate of Cornelius Cole in Hollywood, which had a great view of the sunset over the Pacific Ocean. From there, it’s simple to extrapolate how the street got its name. 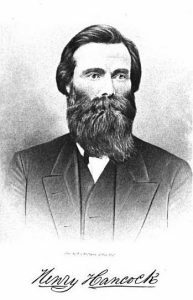 Cole was a U.S. congressman and senator who originally organized the California branch of the Republican party in 1856. The importance of Canadian native William Hamilton Hay to West Hollywood’s development cannot be overstated, historians believe. Hay alone built the luxury estate that Russian actress Alla Nazimova purchased and turned into the legendary Garden of Alla Hotel. Hay also developed a 160-acre neighborhood to the east of the hotel that he called Crescent Heights, thus giving rise to the name of the street alongside it, Crescent Heights Boulevard (1905). The same year, Havenhurst Drive was named with the “y” intentionally dropped from Hay’s last name, according to county land records. Another street named after Hay – Hay Avenue – was changed to Hayworth Avenue in 1905 as well. Finally, Norton Avenue (1910) was named for C. E. Norton, Hay’s partner in a Los Angeles real estate practice. Hancock Avenue (1907) is a salute to Major Henry Hancock, who acquired about two-thirds of the immense Rancho La Brea land grant in 1870 through his brother John. He was a New Hampshire native, Harvard-trained lawyer and government surveyor who came to California during the Gold Rush. There were constant battles over who actually owned the land, and it was not until 1877, when the U.S. Supreme Court ruled in favor of the Hancocks, that the disputes were settled. John Hancock was formally granted 1,200 acres, and Henry ended up with 2,400 acres. Other men were given small portions of the Rancho. Hancock Park, by the way, was developed by Henry Hancock’s son. Hancock retained a future U.S. senator, Cornelius Cole, to represent him in court battles over the land titles. To pay Cole for his services, Hancock deeded an undivided one-tenth interest of Rancho La Brea to Cole. Waring Avenue (1914) takes its name from Cole’s son-in-law, Capt. Howard Waring. Willoughby Avenue (1913) is named for Cole’s son Willoughby. As a sidelight, 11 streets in and around modern-day Hollywood were named after Cole family members. Gardner Street (1910) originated with Dr. Alan Gardner, an investor and partner of banker Rollin B. Lane, who built the Magic Castle. 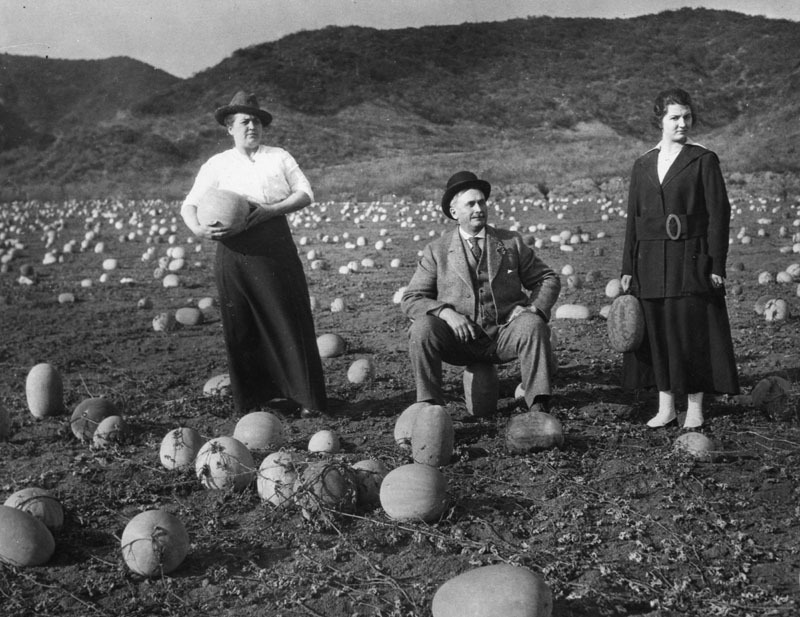 Gardner owned tracts of land in the Hollywood area and in the San Fernando Valley. The Hollywood home of French painter Paul De Longpre, a close friend of Cole’s, became a world famous tourist attraction. A street named in his honor was all too logical, so today there’s De Longpre Avenue (1913). Beverly Boulevard (1921) is one of two city streets with a Massachusetts influence. It’s named for Beverly Farms, Mass., a favorite vacation spot of President William Howard Taft. The founder of Beverly Hills, Burton Green, figured that naming the street after Beverly Farms would be a good way to lure people to his city. In 1906, Burton named a street after himself – you guessed it, Burton Way. Melrose Avenue (1887) is the second Massachusetts-influenced thoroughfare. Ranch owner E.A. McCarthy named the route after his hometown of Melrose, Mass. Naming streets for developers seems to have been sacrosanct and fiercely defended by city officials, as the naming of Robertson Boulevard in 1923 showed. The City of Los Angeles agreed to rename its section of Preuss Road as Robertson Boulevard to honor developer George Robertson. Beverly Hills also voted to rename its stretch of road after Robertson. But according to the Los Angeles Times, Culver City balked: Harry Culver, the city’s founder, refused to allow the name of a competing developer to adorn a street in his town. The Robertson Boulevard name stops at Washington Boulevard – just inside the Culver City border. Streets in the Norma Triangle neighborhood seem at times to be something of a Bermuda Triangle of street names. Their lineage has existed for many years in the murky realm of local legend rather than in historical fact. And then there’s the disputed lineage of four streets in the west side’s Norma Triangle neighborhood – Norma Place (1922), Lloyd Place (1922), Cynthia Street (1922) and the ever-popular Dicks Street (1922). • Clark Street (1907) is named for Eli P. Clark, Sherman’s brother-in-law and business partner. • Hammond Drive (1907) most likely carries the name of M.E. Hammond, treasurer of Sherman’s Los Angeles Pacific Railroad. • Larrabee Street (1906) apparently is named for W.D. Larrabee, superintendent of the Los Angeles & Santa Monica Electric Railway, one of many railways owned by Sherman. • Sherwood Drive is believed to be named for Robert Sherwood from the Los Angeles Railway. • Croft Avenue perhaps carries the name of Joe Croft, a senior manager of conductors / motormen for at least one of Sherman’s streetcar lines. 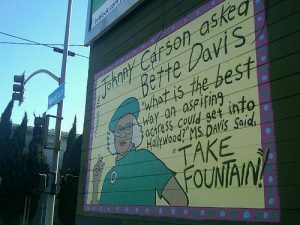 A wall mural along Fountain Avenue in 2012 tells the story of Bette Davis’ appearance on “The Tonight Show” when she talked about the street. (Photo courtesy Fountain Avenue blog). Not every street fits nicely into any particular category. One of the most charming neighborhoods anywhere is Spaulding Square, eight square blocks of beautifully restored homes in Colonial Revival, Craftsman, English Revival/Tudor, Italian/Mediterranean Revival, Prairie and Spanish Revival styles. The neighborhood and Spaulding Avenue (1913) are named after Alfred Starr Spaulding, its architect. Fulton changed to Spaulding and Spaulding changed to Stanley. St. Thomas the Apostle Episcopal Church on Hollywood Boulevard traces its beginning to pioneer Mary G. Ogden, who organized a church school in her West Hollywood home in 1919. Ten people attended the first service, and Ogden Drive is named in her honor. Ogden originally was named Friend Avenue. • There was a Plummer Street along the eastern-most boundary of today’s city limits – no doubt named for Col. Eugenio Plummer, who acquired 160 acres of land in 1874 where Plummer Park is located today. Plummer Street existed until 1906, when its name was changed to La Brea Avenue. • Another big change recorded on county tract maps states that the former Newcomb Street underwent a name change to La Cienega Boulevard in 1910. • Before Lexington Avenue was given that name the same year, it was known as Emelita Avenue. Also in 1910, a portion of Alfred Street was changed to Hacienda Place. • The first article posted July 5 notes that Friend Avenue was renamed to Ogden Drive in 1913. It turns out that Friend was previously known as Mountain View Avenue until 1906. • Present-day Edinburgh Avenue also had a previous life – as Donald Avenue – until it got its current name in 1920. Sunset Strip historian Jon Ponder contributed to this article. My grandfather is Harland Willey. Harland Ave & Willey Lane. I believe my great grandpa was a land developer and family lore is he helped subdivide the area and named some of the streets. They lived above Sunset and legend is that at Hollywood High only my grandpa & the principle owned cars. So great grandpa must have been doing well. I hope this helps. @Todd…it might have something to do with the the building tracts and how postal codes were distributed back in the day. What is interesting in my research is it seems all the homes on Cinthia were built in the 50s. You cross the street to Weho and they date back to the 1920s. Phyllis is called “Street” in Beverly Hills and “Ave” in Weho. And on a side note…there seems to have been A LOT of street name changing going on back in the day. They didn’t seem to have much of a problem then. But what I find interesting is whenever the residents of Dicks Street were all in favor of changing it to Dickson Street (for obvious reasons)…the city council turned them down citing history…whenever no one will really knows the truth to the creation and naming of Norma’s Triangle. @SaveWeHo – I’ve always wondered the same thing. Is it that our wealthy neighbor doesn’t want to be associated with us? But if that’s the case, why not change the name of Elevado or Phyllis? (And just who was Phyllis?) Maybe our Cynthia was changed… Inquiring minds have no constructive use for the information, but it sure would be interesting. I’ve always been curious why the name changes from Cynthia to Cinthia when you enter into Beverly Hills across Doheny. I just want to know where Harratt St got its name. This is all very interesting on how the WEHO streets got their names. The only area I don’t seem to see is the development between Robertson and Doheny, south of Melrose (Rangely, Ashcroft, Dorrington, Almont, Rosewood, etc.). Do you have any info on those? Damn. I was hoping for a better explanation of the Norma Triangle streets. I wonder if they have anything to do with Mrs. Elizabeth Schwall – the woman who owned much of the land in the area. She acquired the land (approximately 50 acres) in a settlement with the Los Angeles and Pacific Railway sometime in 1893. Apparently she had a vendor’s lien against the railroad for $14,000 – which was a lot of money back then. No mention of what she was selling, but it was very unusual for a woman to be involved in these kinds of business transaction in those days. If you look at the property tax maps of the Norma Triangle, it still says that it’s “Mrs. 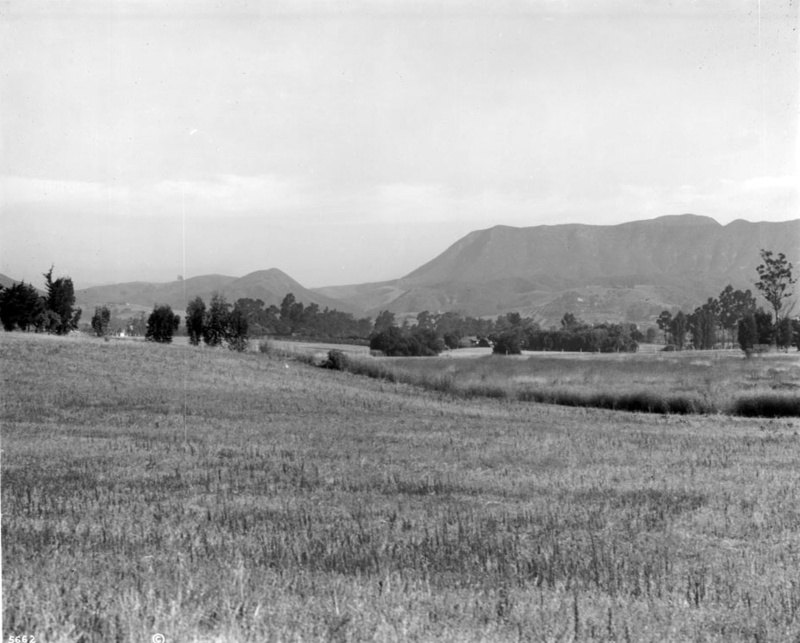 Elizabeth Schwall’s Subdivisoin of a Portion of the Rancho Rodeo De Las Aguas” of Old Sherman. She lived on Cynthia St (no mention of the mister), so maybe it’s possible that the street names in the Triangle (or at least some of them) have a connection to her.